NOTICE: THIS MOTORSPORT/RACING PRODUCT IS NOT DESIGNED TO MEET ANY FEDERAL EMISSIONS STANDARDS IN THE USA AND IS NOT FOR STREET OR HIGHWAY USE. THIS PRODUCT IS NOT C.A.R.B. COMPLIANT AND IS NOT FOR SALE OR USE IN CALIFORNIA, USA. APR MAKES NO CLAIMS THIS PRODUCT COMPLIES WITH ANY EMISSION LAWS IN ANY JURISDICTION. IT IS ENTIRELY THE RESPONSIBILITY OF THE PURCHASER TO INFORM THEMSELVES OF ANY LAWS OR REGULATIONS WHICH MAY PROHIBIT USE OF THIS PRODUCT. APR Presents the EFR7163 Turbocharger System for the 2.0T EA888 Gen 3 engine! The APR EFR7163 Turbocharger System produces up to 536 HP and lays down 10-second quarter mile passes, all through a convenient and affordable, turn-key solution. It represents a threat to the establishment of turbo four cylinder vehicles of yesteryear, and breaks the hearts of muscle cars and exotics everywhere as they are left in the dust by an engine a third the size of theirs, screaming a turbocharged battle cry as it passes. It is a vicious beast, yet a beast easy to tame. It makes for a civilized daily driver that quietly sips premium fuel with surprisingly excellent mileage. Deceivingly quick transient response, with near stock-like turbo lag makes for an experience devoid of the compromises many would expect from an engine this size. It is the answer to the desire for more power, and it’s the brainchild of APR’s talented engineering teams, with over a year and a half of initial development, and a never ending drive for perfection. It is easy to install, blisteringly fast, and produces an absolutely exhilarating driving experience! Offering up to 536 HP, this is the most powerful 2.0T turbocharger system we have ever created! 10-second quarter mile passes, and 0-140 MPH sprints 15 seconds faster than a stock Golf R! A Borg Warner twin scroll EFR7163 delivers amazing top end power with incredible response all in a ultra-reliable turbocharger unit. No headaches sourcing parts or costly "dyno tuning." Stage III+ is a complete bolt on solution all the way down to the APR ECU Upgrade software that makes it all possible. APR’s Engineers have done the hard work. They have tested what works and what does not to deliver a true bolt-on package worthy of the APR name. No corners were cut. Stage III+ only uses the highest quality materials and components. Select an image for more photos and details below! Included with the turbocharger system is APR’s world-renowned Stage III+ ECU Upgrade! This software upgrade installs on the factory ECU and requires no extra end user configuration or tuning and eliminates the need for costly piggyback controlling devices. Simply visit any APR dealer and the software installs in minutes! APR’s Engineers spent more than a year and a half researching and developing the factory engine management system to operate seamlessly with the extensive changes introduced at Stage III+. This includes thousands of full power sweeps on the engine and chassis dynos, street and track. This was no simple task as power is well beyond the original configuration with extensive hardware changes. Through both ECU source code and calibration changes, APR’s Engineers converted the system to run with a substantially larger turbocharger, featuring a pneumatic wastegate actuator and larger MAP sensors. At Stage III+ power levels, the software supports larger port injectors and a larger fuel pump. To better understand the complexity of the engine management system, one must first understand the models within. The factory engine management system uses modeled, or simulated input, to control the engine without the need for costly sensors. While some sensors are still used, the ECU does not measure how fast the turbocharger is spinning, temperature of the exhaust gasses, or how much backpressure is in the turbine housing, among many other important things. When developing the factory calibration, sensors were used to measure each of these items and then models were made within the ECU and the sensors were removed. The ECU then relies heavily on expected behavior from factory components. However, if these components are altered, such as changing the turbocharger, the models no longer work and the engine no longer runs correctly. This is why properly created Stage III+ software is so critical. To properly configure the ECU, APR’s engineers spent months updating the ECU’s modeled information to the new hardware specifications. While on the engine dyno, various expensive and sensitive probes were installed throughout the engine allowing APR’s engineers to measure and alter critical information within the ECU. When hardware changes were necessary, APR’s Mechanical Engineers were able to make changes, rather than requiring the calibrators to tune around the shortcomings. APR’s incredibly powerful and proprietary ECUx data logging suite allowed APR’s engineers to monitor every change within the ECU at extremely high resolution, ultimately resulting in a calibration that is responsibly created. The ECU fully understands the changes Stage III+ brings, and as such, can properly manage and control the engine. Because of this, APR’s Engineers can aggressively seek exciting power levels without taking risky shortcuts. The engine operates more smoothly, enhancing everything from daily driving to full-on acceleration. Fuel economy is better and the ECU can properly protect the engine from dangerous operating conditions. To APR’s Engineers, it’s responsible tuning. To the driver, it just works. Response, top end power, and reliability were all at the forefront of the Stage III+ turbocharger selection. Typically, these features do not go hand-in-hand. Larger turbos tend to be laggy, while small, responsive turbos lack top-end power. However, the Borg Warner EFR7163 has broken the mold. Featuring the latest advancements in technology, combined with APR’s advance tuning strategies, the ultimate in performance and reliability has been achieved! The EFR7163 features a massive, 71mm forged-billet compressor wheel capable of outflowing the competition due in part to its extended-tip compressor geometry. By providing up to 60 lb/min in airflow, the turbocharger is capable of producing massive power and provides headroom for increasing output with future modifications. To spin the massive compressor wheel quickly, the EFR7163 features a lightweight turbine wheel made from titanium aluminide, or Gamma-Ti, and feature new Mixed-Flow geometry. At nearly half the weight of conventional turbine wheels, the difference is extremely noticeable as transient response is lightning-fast upon smashing the accelerator! To further aid in low-end response without sacrificing top-end power, APR’s engineers built Stage III around the EFR’s optional T4 divided twin scroll turbine housing. This stainless steel housing is internally gated, making it the perfect solution for this application. With reliability also at the forefront of APR’s engineering design criteria, the EFR continued to shine as the clear choice. APR chose the optional aluminum center section, which houses the EFR’s massive ceramic ball bearing housing. Unlike traditional housings, and journal bearings as found on the OEM IHI turbocharger, the bearing arrangement provides a large thrust-load capacity, and thus reliability, over other setups. Friction is reduced, turbocharger response is enhanced, and oil blow-by resistance is greatly improved, making the EFR an extremely reliable solution. The EFR7163 features an integrated recirculation port for mounting the factory diverter valve (DV), boost control solenoid (N75) and wastegate actuator, all of which ultimately reduces complexity of the install, and reduces engine bay clutter. Furthermore, APR’s engineers integrated a stainless steel heat shield onto the turbocharger, to protect surrounding components. Each unit comes assembled and clocked, with the wastegate preload set, measured and tested, to ensure the unit simply bolts on without any modification necessary. The factory electronic wastegate can become problematic at higher output levels. The unit’s electronics are sensitive to heat, and the plastic gears within can strip and fail while struggling and failing to hold and control boost pressure. In the event of failure, replacements are typically only readily available by purchasing a new OEM turbo, making for a costly scenario. APR’s engineers upgraded the wastegate with an APR by TurboSmart pneumatic wastegate. The unit is capable of accurately controlling and holding higher boost pressure levels without prematurely cracking open, or overheating under prolonged use. The unit simply comes assembled, configured and installed on the turbo, ready for use! The APR Exhaust Manifold Adapter is investment-cast using the nickel-chromium-based Inconel 625 super alloy, with reliability, strength and performance at the forefront of the compact, twin scroll design. In an effort to optimize performance through decreased turbocharger lag, quicker transient response, and maximized peak power, APR’s engineers designed and tested single and twin scroll manifold adapters. The twin scroll design was ultimately chosen as it spooled the turbocharger several hundred RPM sooner and offered no measurable tradeoffs. Inconel 625 is typically the material of choice on motorsport applications and was chosen for its exceptional strength and high temperature resistance characteristics. Compared to other common materials such as iron or lower grades of stainless steel, Inconel 625 is costlier, but withstands extreme exhaust gas temperature changes without expanding, contracting, cracking or melting under high stress. A loss wax investment casting technique is used in the creation of each manifold as the method produces repeatable parts with organically shaped internal flow paths. Mounting surfaces are CNC machined flat, and manifold studs are preinstalled in-house. Exhaust gasses are smoothly routed through the adapter, reducing turbulence and exhaust back pressure, to further aid in performance. Lastly, unlike a hand-fabricated design there are no welds to stress and crack over time, further increasing the reliability of the APR design over other design methodologies. The turbocharger inlet and outlet hoses are designed with performance, strength, longevity, and total compatibility with all factory components. The hoses feature a multi-ply silicone design, which are internally lined with a flourosilicone coating. These materials were chosen to maximize performance, even under extreme conditions, and to protect against oil and gasoline degradation. Furthermore, at each connection point, the hoses use APR’s EZ-Flow stepped design to provide a port-matched surface transition, as it eliminates performance-robbing airflow disruptions associated with other designs. Each hose is oriented such that it is completely compatible with all OEM parts. The turbocharger outlet pipe simply slips over the factory turbocharger discharge pipe, while the turbocharger inlet pipe uses CNC machined, billet aluminum adapters that mimics the OEM mounting surfaces for the PVC hose and intake hose. Lastly, a billet vacuum reference port for the wastegate’s boost solenoid is preinstalled on the intake adapter, simplifying the install. Reducing the chance of a leak is critical to performance and as such, the pressurized turbocharger outlet pipe features two high-strength stainless steel T-Bolt clamps from Clampco. The non-pressurized turbocharger inlet hoses use clean and low-profile, OEM-style Oetiker clamps to hold the billet adapters and comes preinstalled. Lastly, a worm gear clamp is used to easily attach the turbocharger inlet pipe to the turbocharger. The Borg Warner EFR Turbocharger’s outlet size differs from the factory turbocharger and as such, a new 3” V-Band Race DP is necessary and included. For customers with an APR Cast Race DP Exhaust System, the included portion replaces the upper cast section and mates directly to the APR Catalyst Midpipe. For customers without an APR Cast Race DP Exhaust System, the APR Catalyst Midpipe is available separately. The midpipe is fully compatible with the factory catback exhaust system. The 3” V-Band Race DP is created from T304 stainless steel and features cast bends with argon back purged TIG welding throughout. The system uses APR’s low profile OEM style flex section, non-protruding oxygen sensor bung, and thick mounting bracket. Each Race DP is assembled, finished and quality controlled in-house. To provide accurate closed-loop boost control through the factory ECU, new MAP sensors and mounting hardware are included. The ECU is recoded to fully work with the upgraded sensors, completely eliminating the need for clumsy and archaic stand-alone boost controllers. In doing so, the ECU retains control over the turbocharger and provides better daily drivability with increased safety. The pre-throttle MAP sensor is upgraded with a Bosch 4-bar sensor. The factory post-throttle T-MAP sensor is retained for accurate temperature readings and an AEM Stainless Steel 5-bar sensor is included and attached to the manifold through the included APR Stage 3 Boost Tap. All necessary hardware for mounting and configuring the boost tap is included. The factory oil and coolant feed and drain lines are upgraded with new, application-specific lines that are designed to provide years of leak free operation. The braided stainless steel oil feed and drain lines come fully assembled and feature CNC mandrel bent hard-lines for clean and specific routing as if intended by the OEM. Both o-rings are replaced and a Borg Warner gasket is included. The coolant feed and return lines also feature CNC mandrel bent hard-lines with custom low profile banjo bolts and copper crush washers. Flexible Borg Warner coolant hoses are used throughout, and a rubber heater hose with anti-abrasion shrink-flex connects the system to the heater core. OEM spring clamps make the install easy, and a one time use oetiker clamp provides a strong and leak free connection between the hose and factory fittings. Lastly, DEI heat shielding is included, protecting the coolant lines from heat. No invasive cutting or splicing of the factory wiring harness is necessary as new MAP sensor, wastegate solenoid and DV extension harnesses are included. Each harness comes fully assembled for a simple plug and play install. To cope with raised cylinder pressure and temperature, new spark plugs are included. The plugs operate at a heat ranges colder than stock, which results in better pre-detonation resistance and spark plug life under extreme conditions. All install hardware is included for a complete install. This includes Loctite, assembly lube, an exhaust v-band clamp, Clampco T-Bolt clamps, worm gear clamps, Oetiker clamps, OEM spring clamps, turbo support bracket, Borg Warner and OEM gaskets, low-profile banjo bolts, copper crush washers, copper lock nuts, nuts, washers, bolts, studs, MAP sensor install tool, boost tap cap, various heat shielding materials and a zip-tie. APR has a worldwide network consisting of many professional shops capable of performing installation of this turbocharger system. To accompany our world-class technical support hotline, a full, printed, step-by-step install manual is included to make the install process smooth and simple! - APR recommends and tuned with Sunoco GT 260 for 100 AKI mode and Sunoco GT 260 Plus for 104 AKI mode. Never use lower octane than specified by the mode. - Max increases are based on APR's actual measured stock values and not those reported by VAG. | RON = ROW Fuel Grades | AKI = North American (RON+MON)/2 Fuel Grades. - Reported wheel figures measured using APR's AWD Mustang with multiple vehicles, using SAE correction and an average of multiple runs for all figures. Crank figures are estimated based on the measured wheel figures. Results will vary depending upon environmental conditions, vehicle, transmission, vehicle health, operating conditions, temperatures, fuel grade, dyno type, dyno setup, other variables and other modifications. - Acceleration data collected at the same location with a US Spec 2015 Volkswagen Golf R DSG Stock via a Racelogic P-Box's actual data files (not screen data) with ESP disabled, race/dynamic mode, sport mode, and automatic redline shifts. Stage III+ 93 figures collected with a US Spec 2015 Audi S3, APR Stage III+ with intake, intercooler, midpipe, TCU Upgrade, APR wheels, Michelin Tires and Brembo Brakes. Results will vary depending upon location, environmental conditions, vehicle, transmission, shift points, vehicle health, operating conditions, temperatures, fuel grade, weight, tires, other modifications and more. (1-FT) indicates 1 foot roll out timing. The APR Stage III+ Turbocharger Systems are designed for use with several other modifications. APR strongly advises rebuilding the engine, especially at the maximum power levels. APR strives to engineer the most comprehensive solutions on the market, including validation of APR products and claims through extensive research and development. To receive the best service and support, and to experience and achieve the product’s advertised results, it is imperative to only use APR certified products as results may otherwise vary. Proper maintenance, operation and a quality install is necessary under all scenarios. Please view our requirements and recommendations in the tabs below. North America: APR’s upgraded port injectors and low pressure fuel pump system is required for North American vehicles using APR Stage III+ software. Rest of World: APR’s upgraded low pressure fuel pump and APR's High Pressure Fuel Pump are required for Rest of World vehicles using APR Stage III+ software. Additionally, vehicles with a factory IS20 turbocharger, such as the MK7 GTI, require factory MK7 Golf R / S3 injectors direct injection injectors (Part Number 06L906036L). Lastly, some ROW FWD vehicles may need a 2014 fuel pump basket (5Q0919051BH). Please Note: Never use a fuel grade rated below the software’s requirements. Top Tier Premium fuels are required for pump fuel modes. A minimum of 91 (R+M)/2 octane / 95 RON is required for 91 (R+M)/2 octane / 95 RON mode. A minimum of 93 (R+M)/2 octane / 98 RON is required for 93 (R+M)/2 octane / 98 RON mode. Race fuel modes are designed for specific fuels and may not work correctly with alternative brands. Sunoco GT260 is required for 100 (R+M)/2 octane / 104 RON mode. Sunoco GT260+ is required for 104 (R+M)/2 octane / 108 RON mode. To switch from a lower octane fuel to a higher octane fuel, all fuel MUST be removed from fuel tank, fuel basket fuel lines and fuel injectors before switching software modes. Do not mix fuel grades, blend ethanol, blend octane boosters, or use water or methanol injection to increase octane ratings. Do not use nitrous. Do not alter the direct injection system unless stated otherwise. The APR Front Wheel Drive Midpipe or APR All Wheel Drive Midpipe is required if the vehicle is not already equipped with an APR Race DP. The factory catback exhaust may remain unmodified. Please Note: The factory rear oxygen sensor must be installed. Do not relocate the sensors. Do not space out the sensors. Use the APR o2 sensor harnesses and do not extend or modify any of the harnesses further. Do not use an exhaust cut out / dump tube before the sensor. Do not use smaller than factory exhaust piping on the catback system. Do not use a catback system that’s more restrictive than stock. The APR Carbon Fiber Intake System is required. The APR Intercooler System is required. APR intercooler and throttle body boost hoses are highly recommended to help prevent boost leaks. Please Note Do not change the turbo outlet and throttle body hard pipes with non-oem parts, or use unapproved hoses, or hose clamps. Always boost leak test to 35 PSI. APR cannot make any guarantees as to the longevity of the OEM manual transmission clutch or DSG/S Tronic clutches in every transmission. A manual transmission clutch upgrade is required. APR’s Stage III DQ250 TCU Upgrade is required for DSG / S Tronic models. Proper fluid changes are required. APR strongly recommends rebuilding the engine. Stage III+ power, torque, boost, cylinder pressure and temperature levels and more are substantially higher than stock. APR cannot make any guarantees as to the longevity of the factory engine internals or all factory components on every engine. APR strongly recommends rebuilding the engine, especially at the maximum power levels. A quality engine build is required for successful operation. All one time use bolts, nuts, gaskets and seals must be replaced. Components out of tolerance must be replaced. APR specified pistons are required. This package includes the required wrist pins, and piston rings. Do not use an alternative piston. Follow the manufacturer's install directions. Connecting rods must be upgraded to stronger components, utilizing a 144mm rod length and 21mm wrist pin, with replacement bearings. APR Valve Springs are highly recommended and are required if the engine exhibits valve float. Please Note Do not install oversized valves. Do not alter the camshafts. Do not port, polish, or reprofile the cylinder head. Do not alter the crank pulley. Do not space out the intake manifold T-Map sensor. The factory intake manifold is required. This turbocharger system was designed for use with NGK heat range 9 (NGK-R7437-9) spark plugs gapped to 0.024" ±0.002" or 0.6mm ±0.05mm with a change interval of 10-15,000 mi or 16-24,000 km spark plugs are included and required. Please Note Use caution and do not improperly gap, or drop the spark plugs. Do not over torque the spark plugs. Always follow the manufacturer's install procedure. Only use original OEM coil packs. APR strongly recommends using Motul 300V 10w40, an ester based engine oil, with the APR Oil Catch Can System. Please Note Proper oil change intervals are critical. Motul 300V is not a long life oil. Change oil often, especially before and after heavy track use. Do not go full throttle until the engine oil is up to temp. Only use APR certified parts. High NVH motor mounts may cause false knock, resulting in lower than ideal output. APR recommends the factory diverter valve. Boost taps and boost reference lines see up to 35 psi, necessitating the need for properly rated lines and clamps. Do not use zip-ties to secure boost reference lines. Do not dyno the vehicle without proper cooling. Do not dyno the vehicle in “dyno mode.” Do not alter sensors. Do not alter wiring harnesses. Stage III+ is a lot of power so be smart! If you have questions, ask! Please Note: Application guides may vary from country to country. It’s critically important to check for ECU software and hardware compatibility before purchase. Some vehicles and ECUs may not be compatible. Therefore, an APR Dealer MUST check software availability and compatibility before purchase. 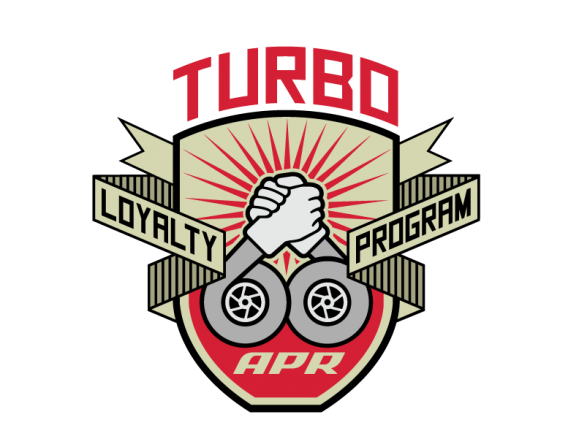 We’re pleased to announce the turbocharger upgrade path just got a little easier for our loyal APR customers. If you’ve purchased an APR ECU Upgrade and want to upgrade to one of our turbocharger systems, you can take advantage of fantastic savings! It’s our way of saying “thank you” for enjoying our ECU Upgrades before stepping up to the big leagues! To see the savings, look over the pricing tiers below. Pricing also includes a fully loaded APR ECU, where applicable! Please Note: An APR Dealer MUST check software availability and compatibility before purchase. - Pricing: Please contact an APR Importer for pricing outside the USA. - Availability and ECU Compatibility: Stages, programs, and features may not be available for all ECUs. - ECU Revision Notice: Multiple ECU revisions exist for each platform. APR software may be temporarily unavailable when factory updates are applied. An APR dealer can check availability in person, or over the phone if the ECU boxcode/revision is known.